Only a couple days left until the start of December and before you know it, Christmas is here! I love the bright colors, comforting scents, joy and excitement that accompany us throughout December. Ideally, it brings loved ones together and we get a chance to share some special moments. Sadly, this is also the season of family members arguing a lot, couples fighting, everyone buying things they don’t need, creating tons of unnecessary waste, and, of course, consuming immense amounts of food. The challenges of celebrating a sustainable and conscious holiday season are many. There is temptation and pressure everywhere to feed a marketing monster that has now become a serious threat to the environment. Until just last season I loved buying Christmas decoration and ornaments. All the wonderful shades of burgundy, red, green, purple, and gold. I used to dream about endless possibilities of styling our Christmas home. Then I saw a documentary based on a BBC article that completely changed how I look at Christmas decoration. All the shiny and glittery Christmas décor comes at a very high cost: it is only possible because thousands of people are sacrificing their health producing it. Most of these workers are working in a town in China called Yiwu, aka the “Christmas Village.” If you don’t know about Yiwu yet read this BBC article, it’s quite disheartening. Since knowing about these horrific conditions, I have not bought another Christmas decoration. I already have more than enough! Plus, how much does the style of a Christmas ball change anyway? So next time you are getting swayed by colors and glitter, the music in the store and visions of a Pinterest worthy Christmas table, stop and think: Did the person making this item get a fair wage and was she/he able to work under safe and healthy conditions? Our addiction to buying “stuff”, which reaches its climax around Christmas, is just one of the many ways we try to compensate for what we really crave: closeness and connection, love and warmth. We misleadingly call it “retail therapy” as if the act of buying unnecessary things is something producing a lasting positive effect (the goal of therapy). As we all know too well though, the minute the rush of buying something new diminishes, we are back to feeling lonely, sad, and insecure or whatever other difficult emotion we are avoiding. Deep down we know that the things we seek are not found in objects. They are found in genuine connections with ourselves and with people around us! So can you still celebrate and enjoy your favorite traditions while being mindful of people and the planet? Thankfully, there are a lot of green and DIY alternatives to buying mass produced Christmas decoration and ornaments. Making them yourself is a sustainable, affordable and conscious way of generating those fuzzy feelings we all want. So let’s start new traditions or remodel old ones this year. 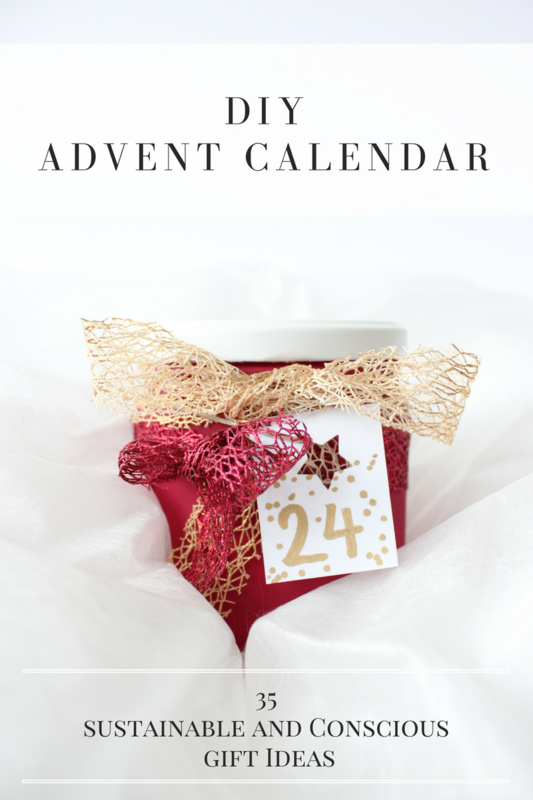 To get started I will show you how to make your own fancy looking DIY advent calendar! This stylish advent calendar offers a way to still enjoy the gifting mood of the season while doing good and being mindful of people and the planet. It allows you to give gifts you know will brighten the person’s day and package them in a way that can be reused without any need of repackaging. It’s easy and cheap to make and you most likely already have the most important components at home: glass jars and some acrylic paint. 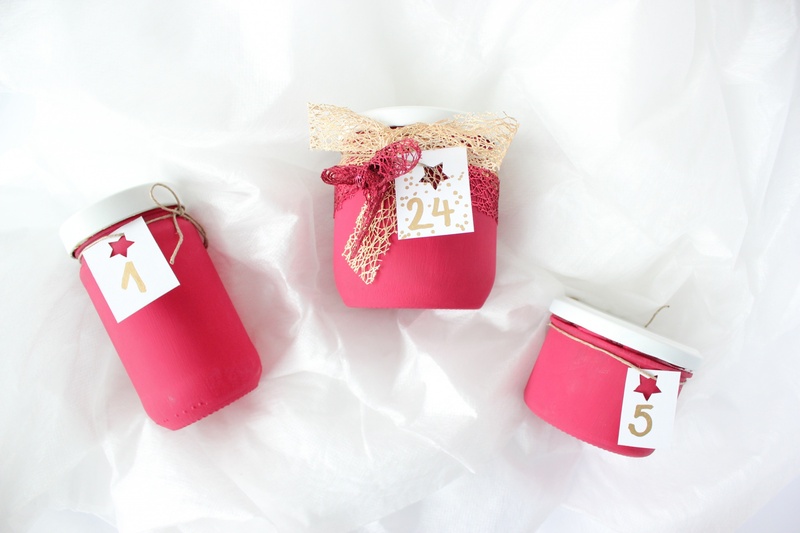 You can make this DIY advent calendar as minimalist and conscious as you like. You can either fill it with sustainable and conscious gifts by supporting green and conscious brands or you can decide to minimize consumption by filling it with experiences (coupons) instead of things! I have compiled 35 of my favorite gift ideas according to different topics so you can adapt the calendar to your needs. The following recommendations fit neatly in a jar or you can always write a coupon for things that are too big. Easy DIY sugar scrub. Check this selection by Ucreate. Small natural wax candle with essential oils. Badger Balms. My favorite is the sleep balm. Pure and organic essential oils. Check doTERRA. Organic coconut oil with oil pulling instructions. Small Furoshiki cloth to use as bag, gift wrap, scarf, and much more. Organic seeds for gardening lovers. For stone lovers: their favorite semi-precious stone or one you find outside and like. Coupon for a non-toxic yoga mat. I like Manduka eKO. Gratitude and mindfulness quotes to start the day on a positive note. “10 things I want to experience with you” letter. Coupon for one night of having the remote all to themselves. Quote or letter with statement of support for a challenge or task this person is facing at the moment. Coupon with offer of being their training or accountability partner. Coupon for a night of staying in and watching their favorite movie together. Coupon for an outing to the library and scouting for new ideas and books. Coupon for a “conscious discussion”: Both of you take turns of 15 minutes each, telling the other what moves, scares, or interests you currently. Focus is on active listening. A small picture of the two of you or of some place you both love. Great to put in his or her wallet! Coupon for an afternoon of drinking tea, eating desserts and chatting about the purpose of life…or anything else that gets you excited. For my calendar, I decided to go with a vivid burgundy/white/gold color combination because it matches my other ornaments and I love the bright pop of color. 24 empty glass jars in different sizes, with lids. Ask friends and family to give you theirs before they recycle them if you don’t have enough at home. The idea is not to go buy empty glass jars at the store. 1 tube of acrylic paint in your favorite Christmas color. I chose a vivid burgundy. One sheet of thick recycled paper in white. Eco Plus: I chose acrylic paint because it offers a large variety of colors and creates a mat look. 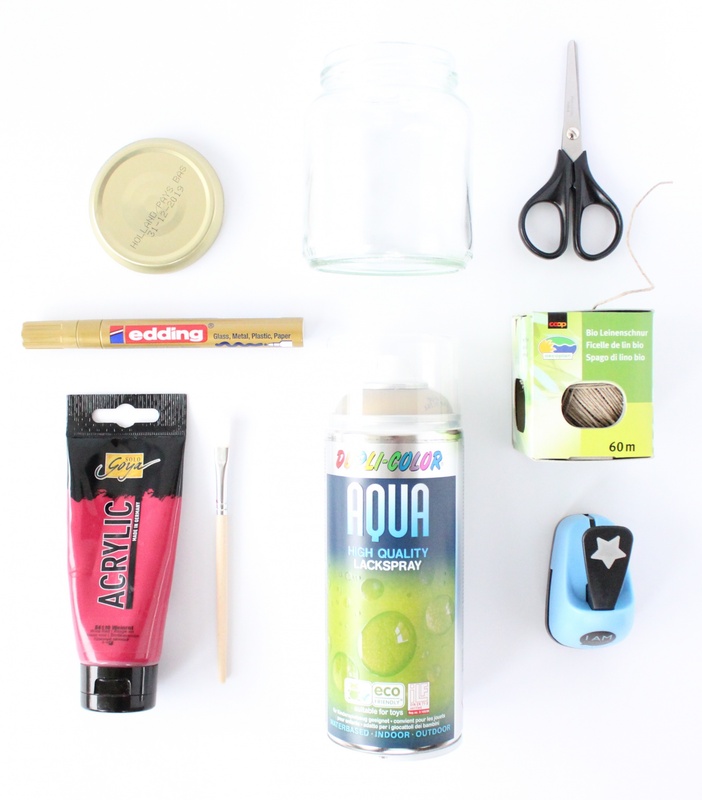 If you want to avoid using paint altogether, you can simply leave the jars plain and wrap your content in recycled paper. If you want to avoid using spray paint, you can try to find gold or white lids. Acrylic paint will not work well on the lids. Put the glass jars and lids in a tub filled with hot water and eco-friendly dish washer soap. Only fill in so much water as to cover the jars and let them soak for 30 minutes. Paint thin layers of acrylic paint on glass jars using a fine brush. To make the glass completely opaque you will need 2-3 layers. Wait 20 minutes at least between painting the next layer. Don’t forget to paint the bottom of the jar! You know, for those curious ones wanting to peak into the glass from underneath. Spray paint the lids (optional). You can also leave them whatever color they are, if you got lucky and have white or gold lids. Mine were all different ones, so I spray painted them white. See instructions on spray bottle for drying duration (usually 1 hour). Always use spray paint outside since it goes everywhere! Cut paper sheet into 24 labels of different sizes. Punch motive (or a regular hole) on upper part of the label. Write numbers on labels using the gold marker. 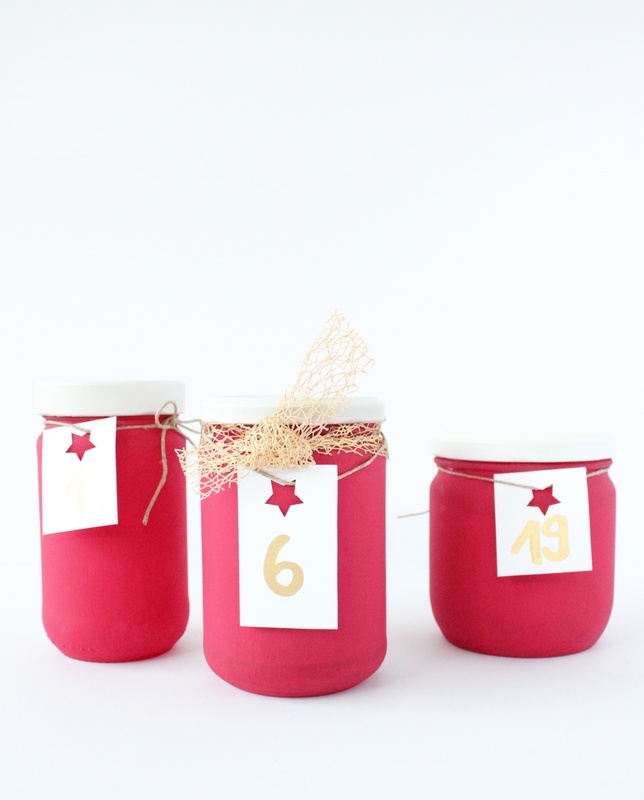 Use gift ribbons or cloth string to tie label to glass jar. I try to mix and match sizes. Make sure to have a large jar follow a smaller one and so on. This creates a more fun looking calendar. I selected the 6th and 24th jar to use a special ribbon on because in german-speaking countries we celebrate Saint Nicolaus on the 6th. Fill with sustainable and conscious gifts or experiences until you are overflowing with love and excitement! Arrange your jars in form of a tree if you like. You can use books to create the different levels. I use eco-friendly (made of renewable materials) garden fleece in white to cover the books or the table. It’s a great fabric to use for all kinds of crafts and decorations, it’s relatively cheap and you can reuse it for all your gardening purposes. For all the bloggers and photographers: It also serves as a great photo background for product photography. The point is to try to use your tools for different purposes. 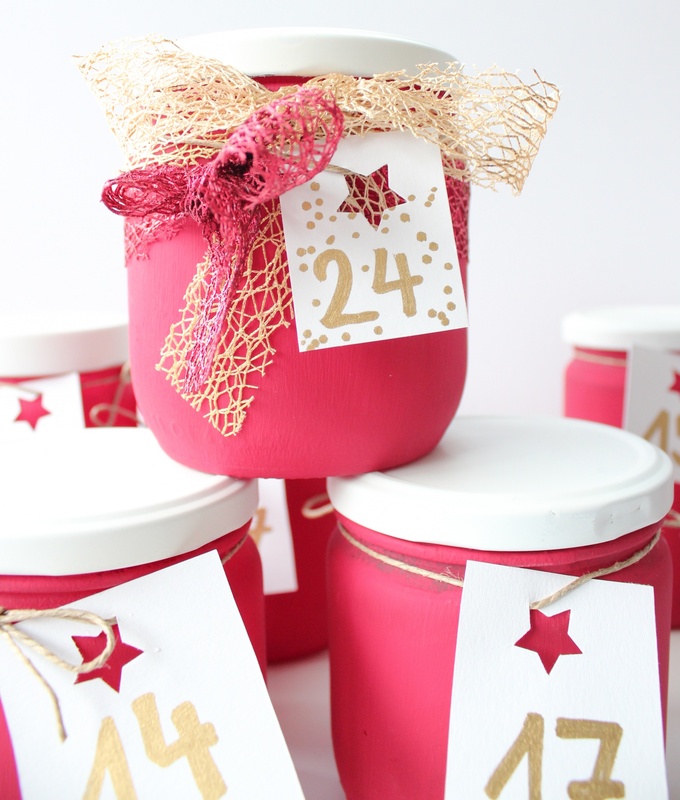 Cover your advent DIY advent calendar until ready for reveal! Hightens the suspense!